The Arlington Regional Master Naturalists have reached a major milestone and expands its public outreach to the community in new ways. The Arlington Regional Master Naturalists group just finished its 10th year as a Virginia Master Naturalist chapter, and over 70 members celebrated the milestone at the Annual Meeting in December. ARMN 10th Anniversary celebration, December 2018. Photo courtesy of Alonso Abugattas. President Marion Jordan welcomed all the members and supporters at the gathering. She also gave a special nod to the first class of 2008, with over half the graduates still as active members. Jordan then thanked the ten+ partners who have worked with ARMN over the years. She highlighted ARMN’s past achievements, present efforts, and plans for future activities. This included an acknowledgment of the various projects on which members have donated thousands of hours during the decade. 2017 Barcroft Park Restoration Planting. Photo courtesy of Karen Thomas. 2015 Champion Tree Bicycle Ride. Photo courtesy of Lori Bowes. 2014 Marie Butler Leven Preserve e-Mammal Survey. Photo courtesy of Toni Genberg. Added to this are citizen science (such as stream water monitoring, bird counts, tree, plant, and insect surveys, and more recently, bioblitzes and other surveys that use internet-based iNaturalist, eBird, and GPS tools to track plant, animals, and restoration efforts). For the future, Jordan stressed the priority of expanding ARMN’s outreach to include more members of the community with events such as “pop-up parks” (to provide nature mini-presentations to passers-by both in parks and elsewhere), as well as more structured outreach to a variety of organizations and citizens. The ARMN members also submitted their own reflections on their past and present involvements in the organization, and how they looked forward to continued participation during the next decade. Active membership in ARMN has grown to over 175 individuals whose contributions have multiplied throughout the years. Just in 2018, members reported over 15,000 hours of work in support of the natural environment locally and throughout Virginia! The ARMN organization has also been honored during its ten years by awards from the National Park Service and Arlington County, and individual members have been honored for their efforts in supporting Arlington’s natural environment. 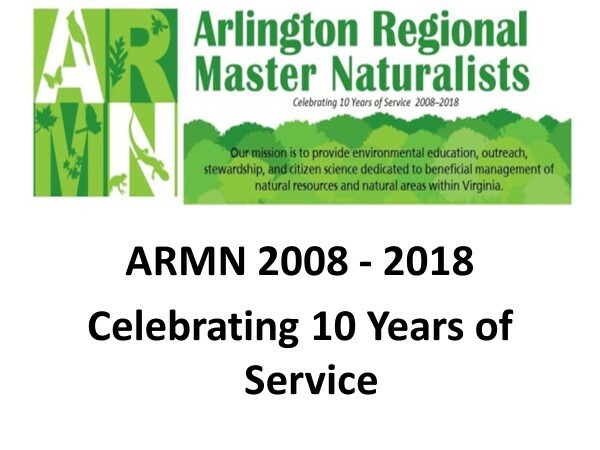 ARMN has recently launched the Arlington Regional Master Naturalists Facebook page to engage members of the general public about local natural events, photos, discussion topics, or other items of interest in our natural world. Anyone can join by applying for inclusion in the group. We hope to see YOU participate there, too! This entry was posted in Citizen Science, Education, News, Outreach, Service Projects, Stewardship by ARMNed. Bookmark the permalink.